Nice Mike.. I like the highlights from the strip box. The scene is decorated by the prom committee at the proms we shoot. Is this all your stuff? I'm attaching a sample of the ball we shot in March. 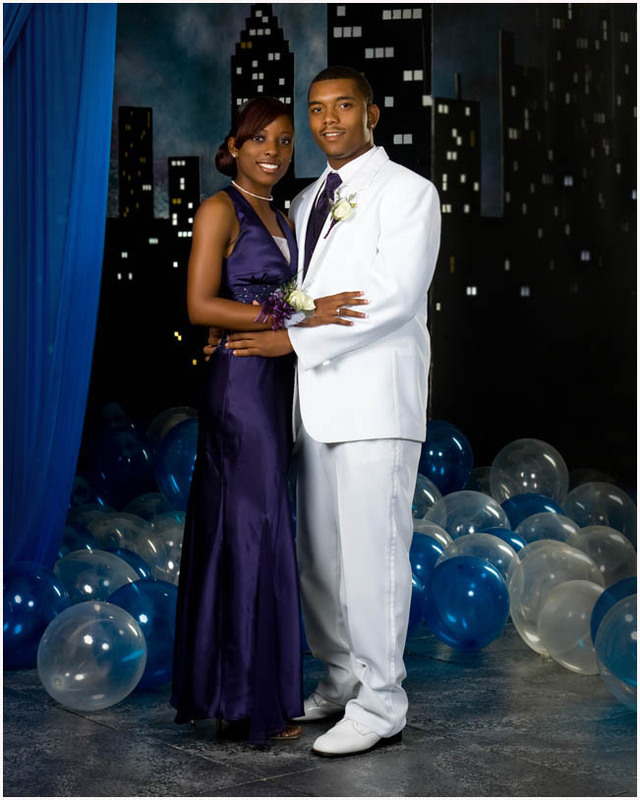 We crop tighter for balls (typically older subjects), full length at proms. This one was from a smaller private school, so we had to do all of the set design etc. ourselves. 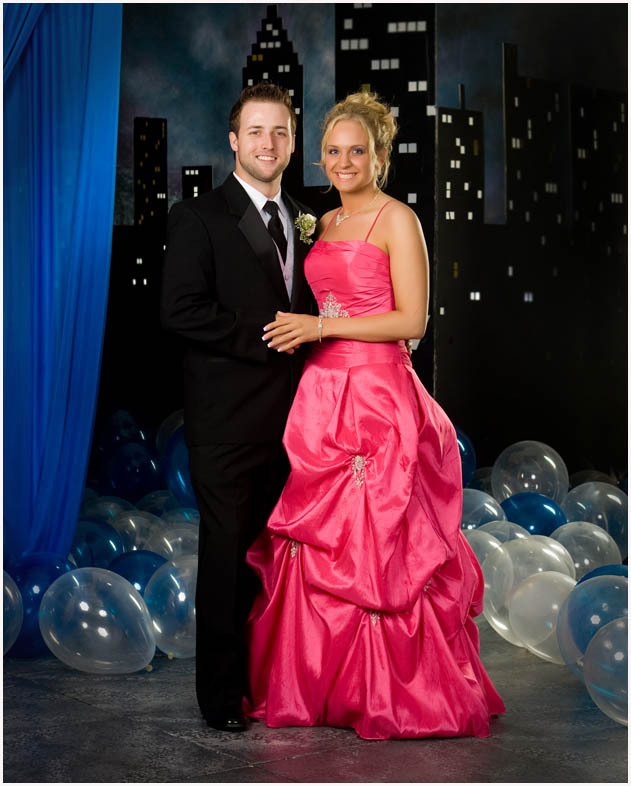 The background was just 4' x 8' sheets of foam core that we cut up to look like a cityscape. So what lights did you use for this set up? I'm also doing a prom and will have to rent lights. And would like to know what you suggest. You provided great advice Ed. Especially about shooting with normal angle lenses rather than UWA glass and shooting from a lower level. Shooting from my eye level would cause perspective distortion (especially with a wider focal length lens). I am sure that we have all seen images in which the subjects' upper body is larger and more prominent than the legs which look small and spindly. I'm 6'2" tall and if I were to shoot today with digital equipment, I would either opt for an articulating LCD or use a right angle finder to lower my position. My own fetish when shooting military personnel is poor posture. Either slumped over or with the head bending forward (I used to call it the chicken neck pose) so that the inside of the back of the shirt and or blouse collar are visible. When I used to shoot groups of visiting foreign military officers at the Armed Forces Staff College in Norfolk, VA; I enjoyed shooting groups of German officers the most. They seemed to have the best posture (they were always ram-rod straight). Old post, but looking for some input. I'm doing a highschool formal in two weeks and I will be using my Profoto B1's (x2). I was thinking of my 5' Octa just a few degrees to my right, high and behind me a tad, with the second light high and to the rear camera-left for a hair/rim light. I think that this second light will be required because I'm using a black background. I have many modifiers, 2x3, 1x4, beauty dishes, 4'-7' brollies, but feel that this would be the best solution. Any opinions? One thing about proms, the lighting issues don't change much over the decades even if the lighting type changes.